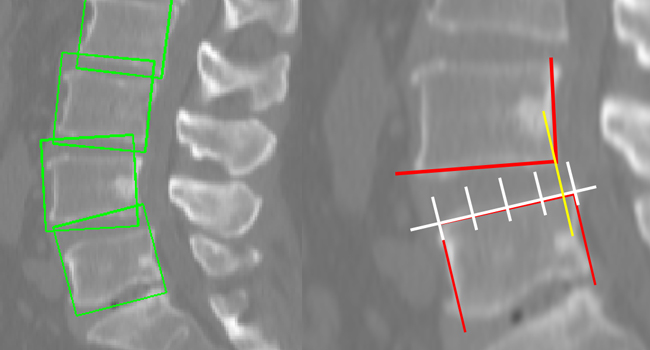 Spine imaging via computed tomography, magnetic resonance imaging, and other radiologic imaging modalities, is essential for noninvasively visualizing and assessing spinal pathology. 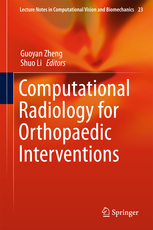 Computational methods support and enhance the physician's ability to utilize these imaging techniques for diagnosis, non-invasive treatment, and intervention in clinical practice. 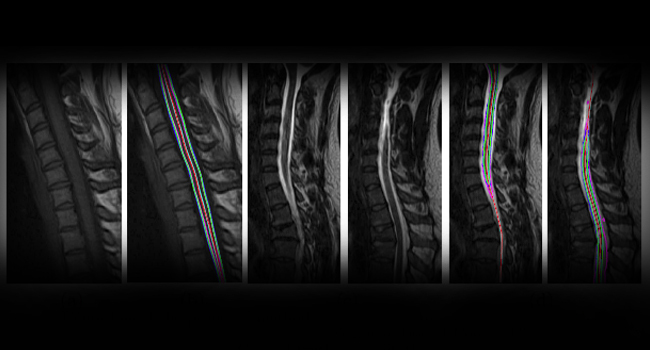 The goal of iSpine program is to establish a comprehensive platform for all imaging related diagnosis, treatment, population based analysis and etc. The spine is a protective shell surrounding the spinal cord, which provides a vast range of autonomic, motor, and sensory functions. Spinal injuries or spine related diseases significantly impact an individual’s health, both physically and mentally. As a result, it can affect one’s peers and place a huge economic burden on society. The leading cause of spinal cord injuries are motor vehicle accidents followed by accidental falls, and violence. Eleven people each week sustain a new spinal injury in Ontario. An accumulated annual economic cost of approximately $2.67 billion is placed on the Canadian government. As of 2016, an estimated 86,000 people are living in Canada with a spinal cord injury (SCI). The annual incidence of SCI in the U.S.A according to the National SCI Statistics of 2016, is approximately 54 cases/million or roughly 17000 new SCI cases/year. In the U.S.A, 243,000 to 347,000 people are living with SCI, which places $9.7 billion on the economic cost. On a global scale, 40 to 80 new cases/million individuals sustain a new spinal cord injury annually. Currently there is a lack of relevant technology in aiding physicians with diagnosing SCI. The development of a universal technology to aid in diagnosis, imaging auto-segmentation, or analysis of SCI would prove to be beneficial. The Digital Imaging Group (DIG) of London was established in 2006. DIG is a group of Medical Doctors, Scientists, and Engineers dedicated to improving and advancing digital medical imaging. We are based in London, Ontario, Canada spread across a number of hospitals and research facilities with affiliations throughout the medical and academic communities in London. This group aims at bridging the gap between the technically oriented research community and clinically oriented researchers. The objective of our research is to investigate, develop, and utilize new digital techniques in order to facilitate the translation of novel research into the clinical diagnosis, monitoring, and therapy of disease. The DIG of London aims at encouraging collaboration between medical doctors, computer scientists, and engineers from industrial partners to accelerate the development of novel clinical tools in the PACS environment. We believe that, with our partners in medical imaging, the DIG of London will enhance the international reputation of London and Canada for imaging and patient care. Current core team: Drs: Shuo Li, Zhijie Wang, Yunliang Cai, Bin Gu, Keng Yeow Tay, Derek Ho, Said Osman, Manas Sharma. Previous members: Drs: Max Law, Ismail Ben Ayed, Brandon Mile. Special Issues in the Most Prestigous Journal! The 4th Workshop on Computational Methods and Clinical Applications for Spine Imaging (CSI 2016) will be held in conjunction with MICCAI 2016 in Athen, Greece. The workshop will take place on Monday, October 17, 2016. 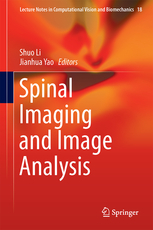 Transactions on Medical Imaging Special Issue on Spine Imaging, Image-based Modelling, and Image Guided Intervention. 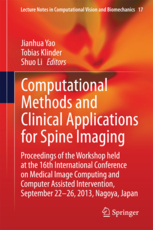 Computerized Medical Imaging and Graphics Special Issue on Computational Methods and Clinical Applications for Spine Imaging. To provide a solid basis for more general spine image analysis problems. To segment spinal images in a single unified framework. To provide an automatic image detection method for the identification of spondylolysis and an automatic measurement for the spondylolisthesis degrees. To provide and validate a method that fuses CT and MR details into a single image. To use simple image based biomarkers to perform prognosis of spinal diseases using non-invasive procedures. To provide a general method to detect different elliptical curvilinear structures under strong neighbouring disturbances. To provide an efficient and accurate clinical tool to aid in the diagnosis of neural foramina stenosis. To provide an efficient and accurate clinical tool to aid in the assessment of scoliosis. Spinal pathologies can affect the vertebrae, intervertebral discs, ligaments, and nerve roots. These pathologies include spinal degeneration, spinal stenosis and cancer. There is, however, a lack in quantitative measurement tools in evaluation of spinal pathologies and their impact on stability and quality of life. Widespread access to 3D imaging technologies has enabled accurate visualization of spinal structures, which in turn has led to better diagnoses of spinal pathologies and more confidence in evaluating treatment effects. Such analyses, however, have thus far been mainly qualitative or semi quantitative. Quantitative analysis of large 3D image data sets is still a time consuming task motivating robust automated methods for widespread utilization. 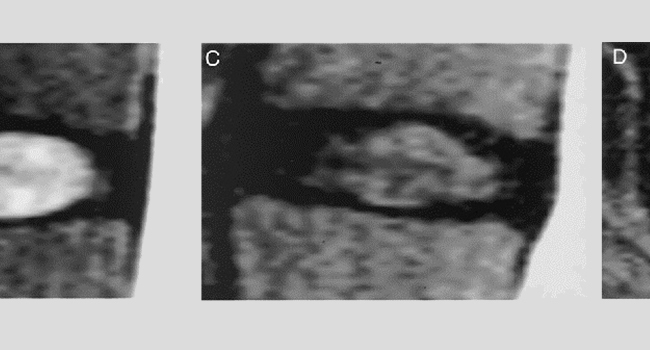 Magnetic Resonant Imaging (MRI) and Computed Tomography (CT) are two of the popular imaging modalities used for the diagnosis of spinal pathologies. CT img are used to visualize the bony architecture of the spine, while MR img are utilized to visualize the soft tissue structures such as tumour, intervertebral discs, and spinal cord. In many scenarios, however, both bone and soft tissue structures need to be outlined to enable confident diagnosis through visualization of the diseased sites and their arrangement relative to other structures. In spinal degeneration, for instance, it is often of interest to visualize the bone and soft tissue to be able to make an accurate diagnosis or a surgical plan. 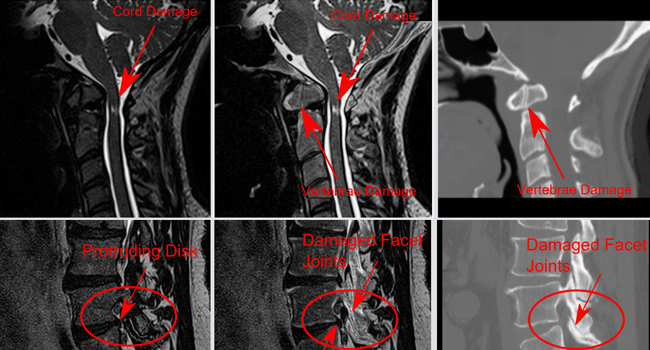 When metastatic disease is present in the spine, osteolytic tumour is best visualized with MRI and osteoblastic tumour and vertebral structure are best visualized with CT; as such, both modalities are required for accurate evaluation of the extent of the disease and treatment effects. In spinal stenosis it is important to visualize both the spinal cord and the vertebral architecture to accurately plan and perform surgery. Multimodal visualization is also beneficial in treating spinal trauma and burst fracture secondary to cancer, where visualization of all involved structures (vertebrae, intervertebral discs and spinal cord/nerve roots) is critical for successful surgical planning. Analyses of multiple imaging modalities can be a challenging task, however, as the img may cover different fields of view depending on the positioning of the patient. 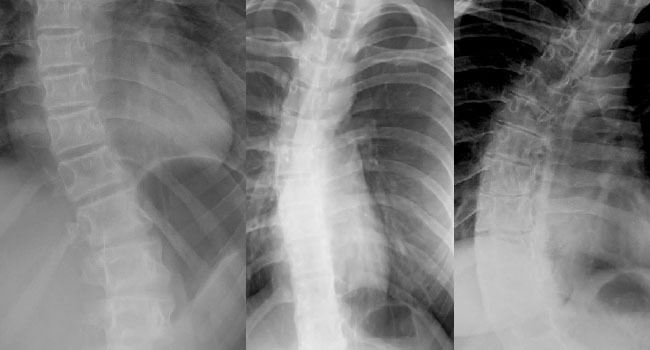 In these cases, the radiologist or the physician may need to switch between the two img many times to be able to fully visualize the anatomical structures of interest. This motivates the development of a fused image that will enable visualization of all anatomical structures in the spine (of both hard and soft tissues) in one image using a common coordinate system. The exponential growth and availability of health data and the existing cloud computing systems make it possible to use big data analysis tools to develop accurate models for the digital diagnoses of spine, cardiac, and eye diseases. Our group is working on leveraging the strength of cloud computing power to help physicians with complicated clinical issue. The main chalenges faced by our group is to analyse the huge amount of unstructred data and use it to develop accurate models for the diagnosis and prognosis of clinical diseases. 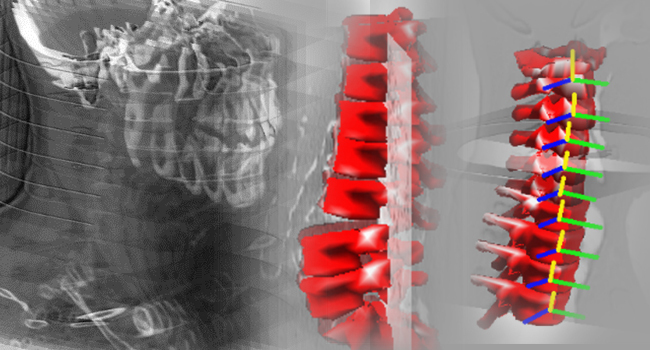 The M³ iSpine Suite is a spine images analysis technique that handles multiple anatomic structures, anatomic planes, from multiple imaging modalities. 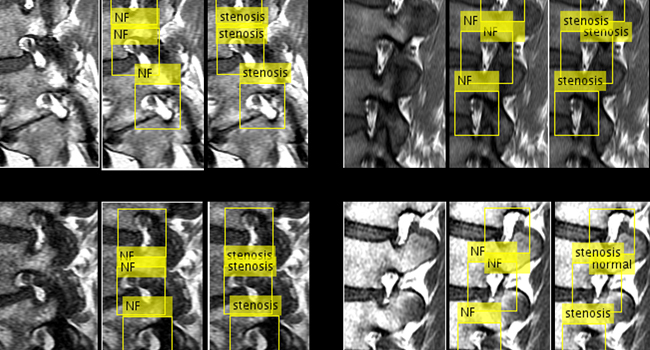 It is a novel spinal images analyzing technique that is capable of performing flexible and integrated quantitative analysis of spinal structures in clinical settings. 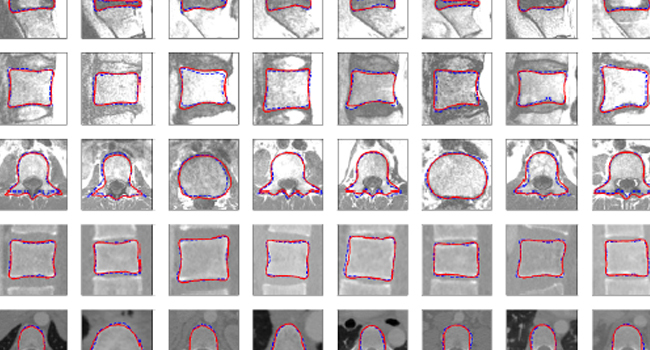 This novel approach is for the first time able to segment M³ spinal images of multiple anatomic structures, anatomic planes, and imaging modalities in a single unified framework. It is based on a novel regression segmentation approach which formulates the segmentation task as a boundary regression problem which can successfully handle the M³ images with improved segmentation and analyses accuracy, and computational effeciency. 1. Yunliang Cai, Sid Osman, Manas Sharma, Mark Landis, and Shuo Li. Multi-Modality Vertebra Recognition in Arbitrary Views using 3D Deformable Hierarchical Model. IEEE Transaction on Medical Imaging (TMI). 2015. Accepted. 2. Zhijie Wang, Xiantong Zhen, KengYeow Tay, Said Osman, Walt Romano, and Shuo Li. M³ Spine Segmentation. IEEE Transaction on Medical Imaging (TMI). 2015. Accepted. 1. Krueger, H., Noonan, V. K., Trenaman, L. M., Joshi, P., & Rivers, C. S. The economic burden of traumatic spinal cord injury in Canada. 2. Mahabaleshwarkar, R., & Khanna, R. (2014). National hospitalization burden associated with spinal cord injuries in the United States. Spinal cord, 52(2), 139-144. 3. White, N. H., & Black, N. H. (2016). Spinal cord injury (SCI) facts and figures at a glance. 4. World Health Organization, & International Spinal Cord Society. (2013). International perspectives on spinal cord injury. World Health Organization. 5. 2014-SCI-Ontario-Annual-Report [PDF]. (2014). Sciontario.org.